There is no good news so far. I have been looking for my parsley pot for weeks and I can't find it anywhere. This is part of the new planter box in our back yard. Do you think it could make a good substitute for my parsley pot? It's quite big. 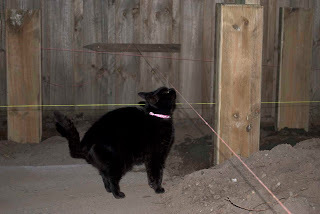 This is me posing on part of the new deck in my back yard. There is still no sign of my parsley pot. I just don't know what I'm going to do about it. 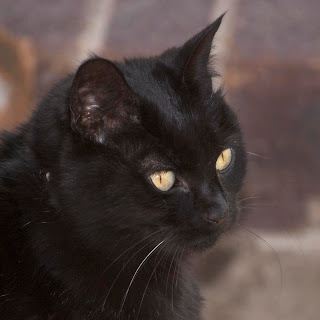 Did anyone notice my single white whisker in yesterday's photo? 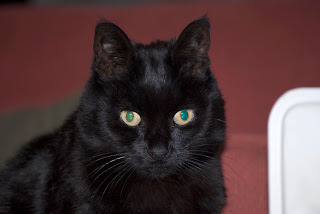 Mum says she only noticed it earlier this year, and we don't know why I have just one white whisker. I'm not that old; I'll be nine in December. Remember a while back when I interviewed Gerri from Happy Hearts cookies? Well, we have some more breaking news from the Happy Hearts kitchen! HM: So what have you been up to since we last talked Gerri? I hear you may have been inventing some new cookie recipes? GD: Oh yes Huffle, I've been working on a new line of cookies for pups with allergies to wheat. They are made with potato flour only and are now certified! HM: Who came up with the new idea, and why? GD: Well, our good buddy Holly in Nebraska, just wanted Happy Hearts cookies so bad, but everyone in her house has an assortment of allergies. The poor pups could not have any fun treats and I felt I just had to do something for them. 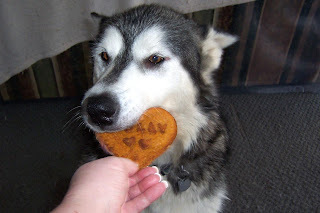 Their mom told me what they could have and could not have, and I created some dog cookie recipes just for them. HM: So what ingredients are in the new cookies? Can kitties have them too? GD: They are made with "potato flour" only, and they have some really good flavors. Peanut Butter/Banana; Applesauce/Banana; Pumpkin/Applesauce; BlueBerry/Banana; and Sweet Potato/Applesauce. 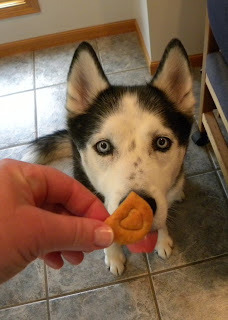 They are a different texture than the regular dog cookies but they are so yummy good! 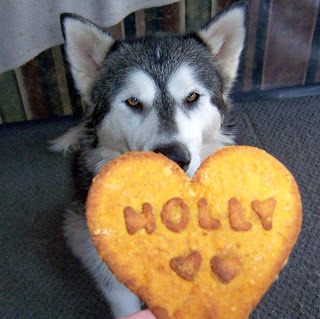 Holly, Khady Lynn, Samuel, Abby, Kona and Monty all love them! I think kitties would be able to eat them if they liked the flavours. They are a much more crunchy cookie so maybe kitties would love them! HM: Are they available now? GD: Yes, I can bake them as soon as you order them. HM: Is there any other special news you want to share? GD: I've also created a new flavour in the regular cookie range, made with watermelon! Dave from the Army of Four loves them and gave a four paws up endorsement. So there you have it, pups and kitties, exciting news from the Happy Hearts cookie kitchen! Visit the website to read more about the ingredients of the new cookies, or to order some for yourself! You can also contact Gerri via email. Either (1) post 7 facts about yourself AND photos OR (2) post 10 facts about yourself with no photos, OR (3) post a childhood picture of yourself. We don't have a scanner at home so mum says she can't show you a childish picture of her. So go ahead mum, tell everyone about yourself. Okay here's my list of 10 things! I was born in Melbourne Australia and have lived here all my life, but I have travelled to a lot of places. I used to wear glasses and was quite blind but I had laser eye surgery two years ago and now have perfect vision. I work for the Victorian government, in the area of catchment management. I started out my working life as a librarian. I don't have any children - Huffle's dad and I are happy with Huffle and she demands enough of our attention. I am petrified of spiders, and have been known to leave the house if no-one else is home to kill them. I am addicted to buying shoes. My favourite book is Catch 22 by Joseph Heller. 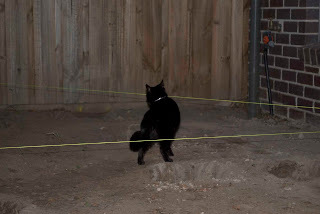 Before Huffle, I had never owned a cat, only dogs. Helping Huffle to blog has made me some great friends around the world, some of whom I've been lucky enough to meet in person! I am just about the luckiest kitty in the world. Mum had a note to go to the post office and collect a parcel this week, so she went on Friday afternoon to collect it. And guess what it was? Something addressed to mum AND me! My BFF Tia and her mum sent me and my mum this beautiful toasty couch blanket, which Tia's mum embroidered herself! Isn't it wonderful? I have had mum put this next to my heater so that I can be extra toasty. It's lovely and soft and warm and I love it! 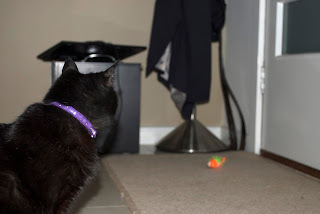 I also got three toys that you can see in that photo, a mouse and a sardine stuffed with catnip, and a laser pointer mouse. Mum hadn't even removed the packaging from the sardine when I started biting it, here are a couple of action shots of me playing with it. And then, in the post this week also arrived a card from my friend Edda! Her brother the Daniel kitten was born a few months ago and he was very very early so mum and I sent Edda and her mum and Daniel a little present, and she wrote me this pretty card to say thank you! So thank you to Edda and Edda's mum, and to Tia and Tia's mum! I love all my new presents. My lovely friends Bugsy, Sassy, Callie, Roxie and Pixie - the Kitty Krew - have given me this award! It translates to "Your Blog is Satin". Isn't it great? List 5 details (things, people, features) that make your life "satin" (translates also as "shiny" or "good"). Pass on to 5 other bloggers that have not already won. I'm starting the weekend early today. Mum was away for most of the week so dad kept me busy doing stuff because he was bored at home alone. Mum arrived home last night so I have to catch up on my sleep today. 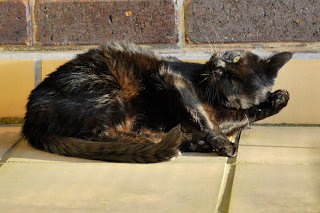 Find the nearest sunbeam and do the same! 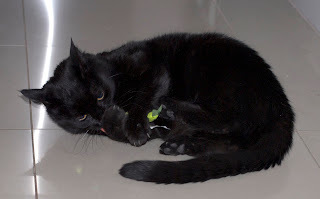 ... that my fishmouse doesn't stand a chance against my claws! 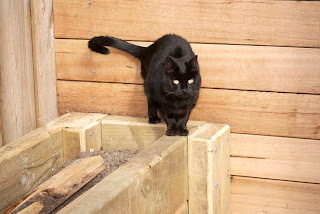 Go outside and play in the sawdust, which is very thoughtfully put there for you by the man doing the garden! 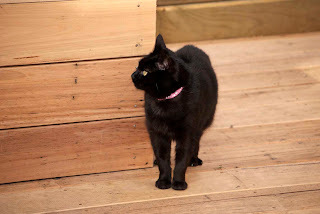 You can see I already have some on my tail, and just after the pupperazzi took this photo I proceeded to roll in the sawdust, then bring it inside for mum to see. She got all excited and started yelling and everything! If one of your paws feels a little cold, just dangle it down between the couch and the heater. It will get extra toasty that way, and your mum won't yell at you for having your paws too close to the heater. Does every pup and kitty know what today is? It's my best friend Zim's gotcha day! That's right, eight years ago today he found his mum and dad and new family. He didn't have the best start in life (you'll find links to his story on his post for today) but he has grown up to be one of the coolest pups ever! Please go over and say hi to him. ... for my parsley pot to come home. My very good friends Milo and Alfie Marshall have shared two awards with me lately! Give thanks and link back to the one who sent you the award. 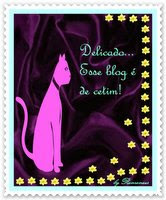 Post the logo on your blog. List seven things about yourself that others might find interesting. Pass the award on to seven other kreativ bloggers. 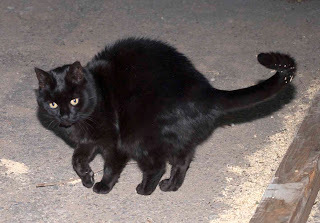 I answer to my name Huffle, but I don't always come when I'm called. Sometimes I just look up at whoever says my name. I sleep in my parsley pot all the time (except this week, coz it's lost!). I don't like fish for dinner very much, but I love my fishy snacks! My favourite snack is ham, closely followed by roast chicken. I usually sleep between mum and dad under the doona. My favourite time to play with my wubba is 3am. This one translates to Your Blog is a Dream (or something like that). The rules for this one are to give 7 beauty tips and pass the award on to 7 bloggers. Water-less baths keep your furs nice and shiny. Eating ham is very good for your complexion. Having a collar that matches your furs is very important. You should not let your people clip your claws - they are a fashion accessory. 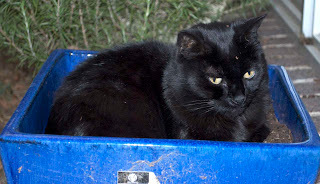 Sleeping in a parsley pot keeps your furs nice. To maintain nice bright sparkling eyes, you should sleep for at least 21 hours every day. If you can avoid the flashy beast, you will not get cranky and then you won't get wrinkles. I would like every pup and kitty who visits today to share in whichever of these awards you like (both if you want to!). Friends, there has been a major tragedy this week. My parsley pot is missing. Has anypup or anycat seen it? Here is a photo to remind you of what it looks like... Please tell me if you have seen my parsley pot anywhere. I miss it! 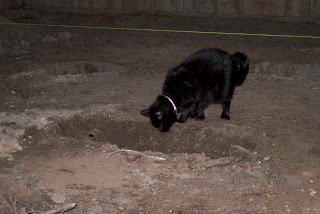 There is a serious problem with my garden renovations. 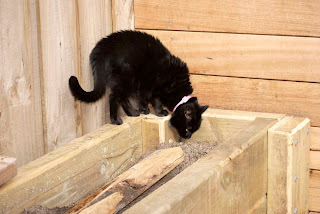 Did anycat or anypup else notice that my parsley pot is missing? Parsley pot, are you down there? Parsley pot, did you fall in the hole? Parsley pot, where did you go? Does anyone know where it might be? While the garden is being done, I have to snoopervise to make sure the men are doing the job properly. It's exhausting work. As you can see, getting the garden done is very hard work! This is what my back yard looked like after the first day the men were here. 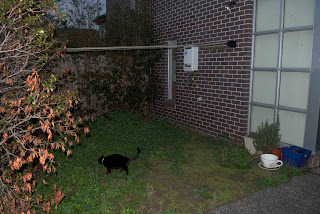 Notice that there is nothing green left in the garden except the bin? This is the side where all the weeds used to be. Now it's just dirt. I don't know if that's better or worse, really. Wait a minute. Have you noticed if something is missing from this picture? I think I mentioned last week sometime that there are going to be some men coming to my house to work on my garden this week. 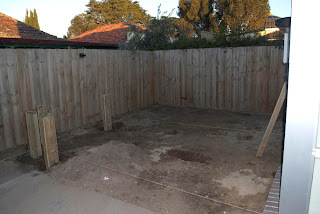 I thought it would be a good idea to show you the tragic state of my garden before they started. Can you see how high the weeds are? I'm nearly lost out there! 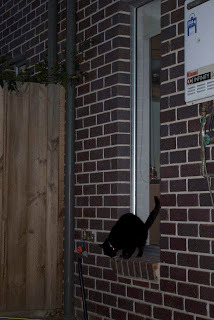 Mum says sorry the photos are a bit dark, she only remembered to get them the night before the men started work. At least you get a vague idea of how awful it really is. But then I was so embarrassed by the Cookie Monster slippers that I started to run away before another photo could be taken. I hope every pup and kitty appreciates the hard work this took! 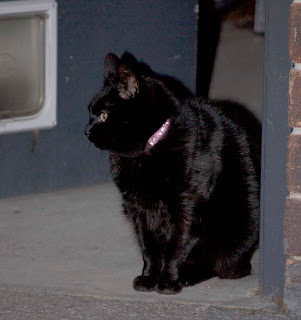 My lovely friend Millie tagged me to play the sixth photo game last week. Since I just played this recently, I am going to cheat a bit for this version. Open your photos folder and select the 6th folder. Then select the 6th photo in that folder and post that photo along with the story behind the photo on your blog. Then tag 5 friends. Normally I would look in the Finder and go to the sixth folder and then get the sixth photo, but this time I used the iPhoto collections and used the sixth photo in the sixth collection there. So this is what I came up with. 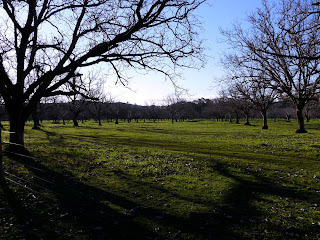 It's a photo mum took a few months ago of a walnut farm in north east Victoria. She says it was very cold but nice and sunny. I suppose it's a nice enough photo but since it's not of me I don't think it's that interesting. If any other kitty or pup would like to play this game, please go ahead. 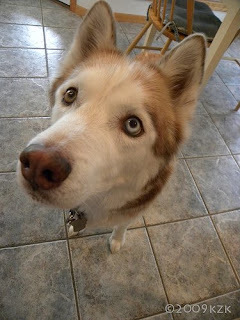 Remember that pup Laska who was lost? Good news: he came home! His new mum searched for him for days and days and eventually found him out in the forest and she bribed him with treats to come home. She might have gotten him home faster if she offered ham, just sayin'. Anyway he is very happy in his new home and that is good news. My paw has recovered very nicely from where the heater bit me last week. It didn't really affect my busy schedule of sleeping so that was good. Mum keeps shooing me away from the heater now but really I think it's learnt its lesson and won't bite me again. There have been men here all week doing things to my back yard. I hope they are looking after my parsley pot. 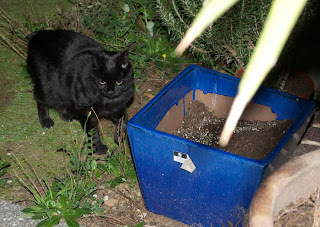 This is me out in the garden one night last week about to get in my parsley pot. If you click on the picture to make it bigger, you can see some little green weed thing growing in my pot! Now there are lots of weeds in my garden but in my parsley pot? This is getting too much! Today I thought I'd share with you my long list of nicknames. I'm sure most of you know that my real name is Stella. Dad named me that when he first adopted me. After a bit, mum figured out that I huffed a lot, and she had been watching a Harry Potter movie, so she called me Hufflepuff after the house in Harry Potter. 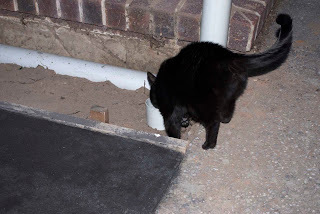 Then dad realised I was a very adventurous cat who liked to explorer things, so I got called Huffle Mawson, Explorer Cat, after the antarctic explorer Douglas Mawson. 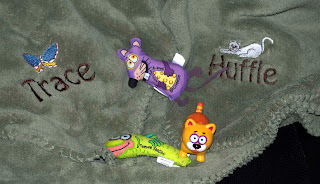 Huffle is the name I answer to. So that's my list of nick names, and there are probably more I've forgotten. Care to share yours? I would like to introduce you to a new friend of mine, Domi. 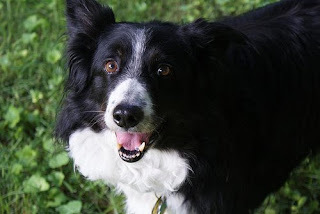 She's a beautiful 12 year old Border Collie, and she is also a therapy dog. Isn't she a pretty girl? 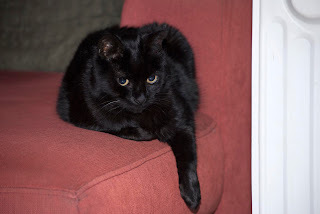 Domi is not very well at the moment, and could use some good vibes from us all. She has some tumours on her neck. I know the power of the paw can help her! We managed to get Laska to come home so I know you can all help. Please go over and say hello. 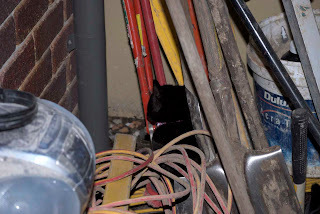 Yesterday, mum and dad spent all day cleaning out the garage in preparation for the garden man who is coming on Tuesday morning. 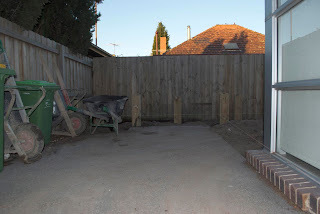 That's so the garden man can get to the back garden through the garage. It looks a lot better now but it was very tiring so I am very sleepy today. 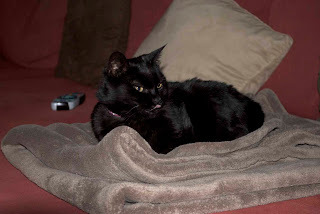 I will be sitting on mum's toasty couch blanket next to my heater, like this. I wasn't happy with the flashy beast capturing me like this last night so I poked my tongue out at it. 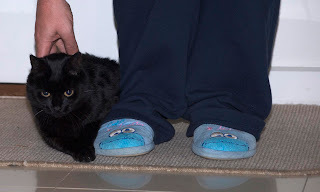 I am still working on getting a photo of dad's Cookie Monster slippers. Don't worry, I will get it! 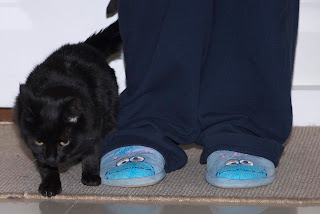 Since so many of you asked about it yesterday, I am trying to get a photo of dad in his Cookie Monster slippers. So far, he is being very elusive. But I will not be thwarted. I'm prepared to use bribery if necessary. He can have my last fishy snack! Happy Independence Day to all my American friends. 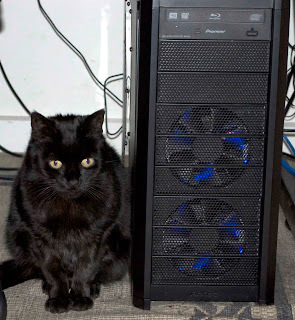 This is me sitting next to dad's computer. We have named it Zim after my best friend because it goes zoom zoom. You can't really tell from this photo but it has blue disco lights inside that flash when the computer is running. What you can't see that mum chopped out of the photo is dad sitting next to me in his Cookie Monster slippers! He didn't want me to tell you that. Oops. 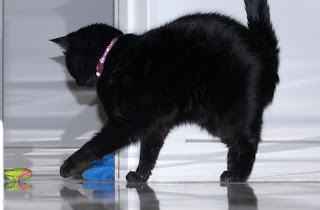 Last week my friends Tipper and Misty asked me about how I keep my furs so nice and shiny. It's a complicated process so you might want to write it down, or maybe print out this page so you can refer to it later. First, it's very important to have a lot of baths. I have at least six per day. But not the kind that involve water. Second, you must sit in the sun a lot. Third, sitting by the heater as much as you can helps a lot. Fourth, if you can sleep under the doona (duvet) you will keep your furs shiny. Fifth, you must take a LOT of naps. Finally, convincing your mum or dad to give you ham or roast chicken helps most of all. I hope this helps all the kitties and pups out there.